At the end of this post I will share with you how you can win a $200 gift certificate from BestBuy! You will see that you’ve got 8 chances to win that $200 Best Buy card. Keep in mind, the giveaway is for the gift card and not appliances. See that photo above? That is the biggest fanciest thing in my kitchen and my new favorite toy. It was almost as if the kitchen goddess had heard our pleas as my old 14 year old range was literally down to its last electric burner (and it was only a small burner and it was only half heating and cutting out when not watched closely). We were pinching ourselves as the guys from BestBuy delivered the 5.9 cu. 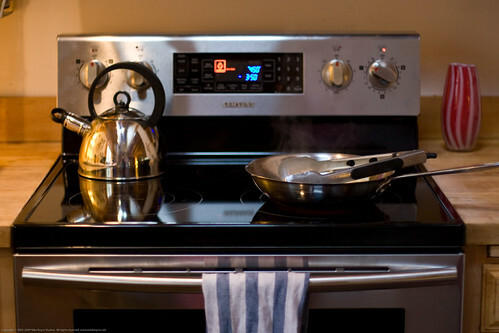 ft. free-standing electric range and the 1.8 cu. ft. over-the-range microwave. We sighed enormously as the old range was pried out of its home and carted away. It was time, past time. The new range nestled right in perfectly and then it and I began to get to know each other better. When I saw the glasstop I was sort of concerned because I have never had one before. I am used to rickety crotchety wobbly uneven scratchy electrical elements that go bad (and will, trust me). The glasstop is no end to neat. If you have one and think I am being a cheesy newbie, too bad! I have been to the badlands of stovetops and I can tell you, first hand, this glasstop business is good stuff. At first it is sort of disconcerting because it seems like you are cooking on your counter. I got over that after a few days. Then, as you start using your various pots and pans you find that the ancient pots that are warped and really are WELL past their good days do not work so great on the glasstop. Just a few of my old craggy pots are no longer useable. 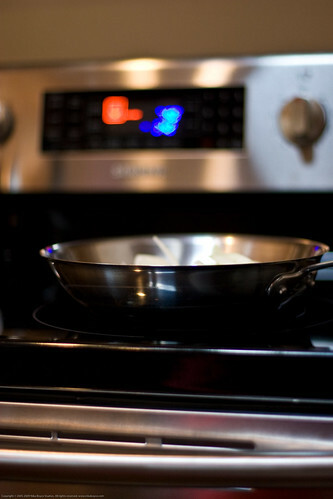 The only drawback, for me, is that I can not use my cast iron frying pan. I am ok with this. I have a countertop electrical element that I have been using and if I need to fry eggs in a cast iron pan I can use that again. For the most part, I am using my stainless steel Emerilware. The first recipe I set out to do as my own homemade benchmarking was pizza, two of them, at once, on two different shelves and right on top of one another. I have made them in the old oven to poor effect (family still choked it down but thats because they love me). 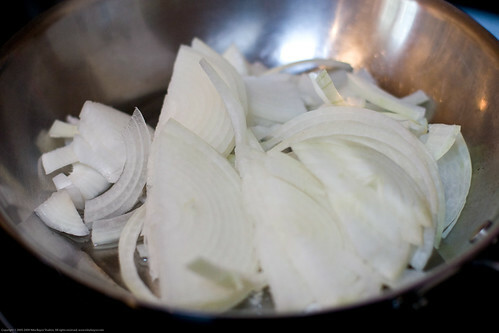 It started with caramelizing vidalia onions on the glasstop. Goodness, the biggest difference was how fast the element heated up the pan. It also got hotter than my old range. Takes some getting used to but I am getting there. While I was caramelizing the onions (slowly), I was using the PROOF function in the convection oven to make my pizza dough. I have since used this same proofing function to make some challah bread. 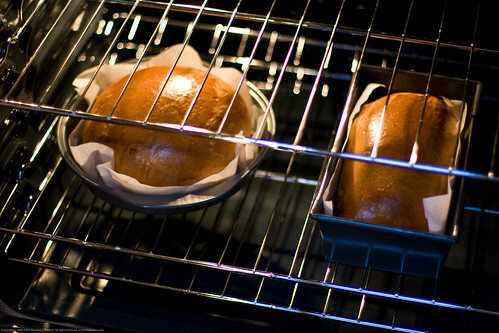 Here are a couple of shots showing those breads proofing. This function is just fantastic! This convection oven is called true because the three fans force HOT air over and around your food. 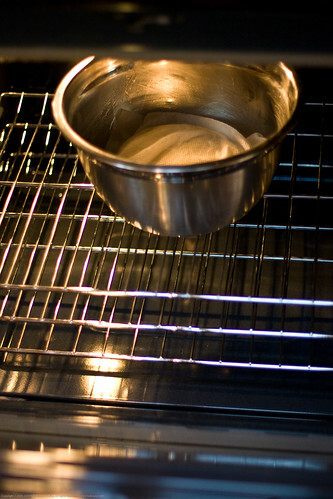 Some ovens just blow in cold nasty unfiltered air from outside of the oven, yikes! 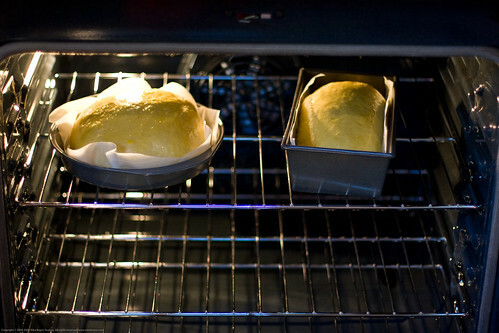 What all this blowing means is that your food, and especially your baked goods, is cooked EVENLY and will brown evenly. It also means that you can live on the wild side and cook two pizzas on two different shelves, right above one another AND THEY WILL BOTH BE PERFECT. 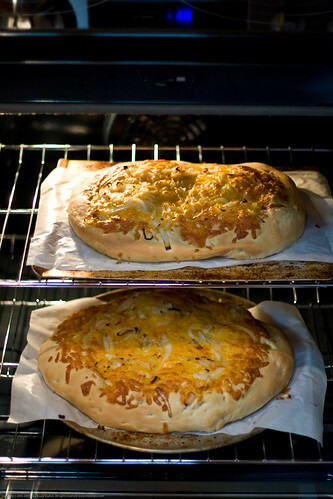 Two very thick and heavily loaded cheddar and caramelized onion pizzas in the oven. Into the oven at 475 F and then, viola! Remember that challah bread I proofed in the oven? 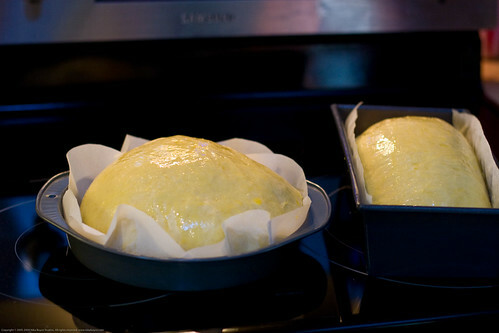 This is what they looked like after baking, just PERFECT. This reminds me to tell you that the oven has a sabbath function. I am not Jewish so I am not articulate about the needs of the kosher kitchen but I do know that one can not light a flame during the sabbath. This mode (which I have not tested yet) will allow you to have a warm oven in a certified kosher manner. Recommendation: This is one very solid and infinitely user friendly and intuitive appliance. For me and my family of 5 with a diverse culinary palate, this range is a perfect fit. I recommend this appliance completely. If you are a baker, this is a HUGE thumbs up! Literally on top of all of this, we also got a new microwave – the Samsung 1.8 cu. ft. over-the-range microwave. This thing fits in the same space as our old (NON-FUNCTIONING) microwave but seems just enormous inside. Our microwave died YEARS ago so my kids had never used one. They have been making nachos and popcorn. They enjoy being able to cook these things for themselves. I have been using it for defrosting meats and also reheating left overs. That might sound mundane but its not. Being able to use this for left overs is HUGE (you know this only when you dont have a microwave) – it really helps one use their left overs more effectively. This means you save money and not waste food. Recommendation: This too is a very solid appliance. I like that it has many functions but the learning curve is very shallow – its easy to start using it immediately. So, let me get to the exciting contest! As I mentioned above, you’ve got 8 chances to win a $200 Best Buy card. Visit Samsung’s site for more information about these and other appliances. To enter, leave me a comment below, in this post, and tell me WHICH Samsung appliance would make your life easier? It doesnt have to be a range or microwave, it can be any of the appliances they make. You may also blog about which Samsung appliance you like most, linking to this post and ALSO leaving a link in the comments below letting me know about your blog post. The contest will begin at 10/5/2009 at 5pm PST and will end 11/15/09 at 5 pm PST. Please be certain that the e-mail address you leave is correct! I could really use a new Samsung dishwasher. Mine is just not cleaning well at all and I basically have to completely hand wash everything anyway! The Samsung Dishwasher would make my life easier. The one we have now is questionable quality, to say the least. A new dishwasher would be fantastic! A new washer and dryer would be awesome. A few more modern settings would make laundry a bit easier. I really need a new washer. Mine is 23 years old, only washes cold and takes forever to fill. It’s time. A new refrigerator would make my life easier. My aging refrigerator leaks water inside, doesn’t have enough space or an icemaker. I’d love to have the Samsung French Door Refrigerator. Our freezer is so narrow, we can’t store anything big in there (like the Christmas turkey). Hubby has talked for years about getting a fridge with the freezer drawer at the bottom, but we can’t justify buying a new one right now. great store to shop in. We could seriously use a new dishwasher. We have been living without a dishwasher for 3 years and I miss having one desperately. So that is definitely the appliance that I would like the best. We’ve been microwave free for 3 years, but I’m ready to have one again! I’d love the super duty microwave! The washer would change my life. I do so many loads of laundry now that I have twin babies. I need something effective (so I don’t have to rewash to remove stains) and efficient (so my environmental impact is reduced). The Samsung Steam Washer looks amazing, and gorgeous. Thanks! Their French door fridge as my GE one freezes my food, and has a broken grill and ice maker. Hate it! I would just love the 27 cu. ft. Side by Side refrigerator (RS277ACRS). With the economy the way it is I could never afford to go out and buy a new stove, refridgerator or a dishwasher. This would be a real treat for me to win this. Thanks! A new microwave above my stove would sure make life nicer. The one we have now is very old & will probably conk out at the most inopportune time. We could really use a new washer and dryer. Ours are very old and I don’t know how much longer they will last. Thank you! I would love a new fridgerator with an ice maker in the door. Ours is so old. All the appliances in my ancient kitchen need replacing. This is amazing! The Samsung fridge would make my life easier, with the French door access and bottom pull our freezer. Easy access and more space too! We would definitely go for a Samsung dishwasher–ours has started leaking onto the kitchen floor! I would love a new dishwasher or washing machine. The Samsung FTQ352IWUX would make my life much easier. My current range only half work. Well, if I can choose between any appliance, then I’d choose an air conditioner. That fridge looks so beautiful! I’d love one. A new washer and dryer would really made my life easier. I would love a new range. Ours is white and it shows everything!! I love the things that this microwave does. I would sure like to try it out in my own home. Your new range is beautiful! I live in an apartment so I’d pick the microwave (since that’s the only viable option!) but it would certainly be an upgrade from our current hand-me-down! I could use a new electric range. Mine is over 20 years old and on it’s last leg. A new Front-Load Washer would make life so much easier! A new dishwasher will make my life much easier. Thanks for the contest. I could really use a new dishwasher. Mine is dying. Thanks for this offer. I could sure use a new washer and dryer to make life easier. My washer & dryer makes one heck of a clunking noise, and I am pretty sure we use more electricity than we need too! didn’t know that about the cast iron hmmm… learn something new everyday.. I think the washer and dryer would find the most use around our home, possibly over used! 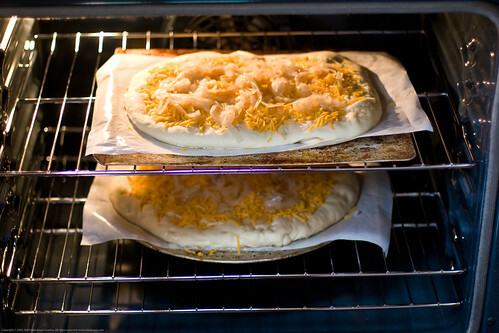 The oven has a proofing function! Holy cow, I need this oven! I checked out Samsung’s site, but I like the range that you picked the best!! 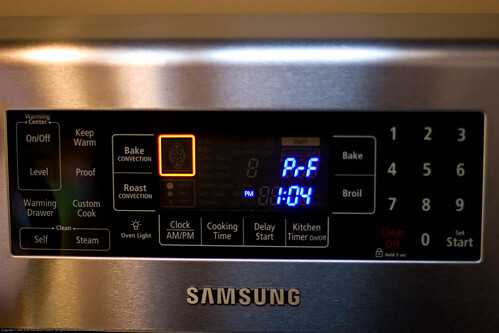 I would love to get a new Samsung Oven! I think this range (and let’s throw in the microwave, too!) would make my life easier. Mine is just gross and doesn’t really work well…doesn’t heat properly, sometimes the oven shuts off by itself, you name it! With a new baby and lots of cloth diapers on the way the 4.0 cu. ft. High-efficiency Front Load Washer WF218ANB by Samsung would be a huge help for our family. A new dishwasher would fill the bill! To make my life better, the one kitchen appliance I’d most like to replace is my dishwasher. It is old, noisy, & sometimes leaky. To make my life better, the one kitchen appliance I’d most like to replace is my range. It is old & inefficient. That refrigerator is what I really need. I would like the 27 cu. ft. Side by Side refrigerator model RS277ACRS. A new range would be a welcome help. Mine sometimes works and then when I need it most it fails me. I would really like a new Samsung dishwasher. We bought a house that had a stainless steel dishwasher but the trays were all rusty and nasty. We havent had the extra cash to replace it, so it’s just sitting there, looking pretty from the outside. Blah. To make my life better, the one kitchen appliance I’d most like to replace is my fridge. we could really use a dishwasher! Fridge (RFG297AARS) would be such a blessing in our house! The tiny fridge we currently have is over-flowing with produce, milk, eggs, and other essentials. The freezer, beware, is crammed with frozen leftovers and the single gallon of ice cream it can hold, resulting in something being pushed out when the door is opened. All that to say, I would sooooooo LOVE LOVE LOVE a bigger fridge! Thanks for the giveaway… We are looking to replace our kitchen microwave, and the Samsung – 1.8 Cu. Ft. Over-the-Range Microwave – Stainless-Steel (SMH9187ST) would be a perfect fit: big interior & reasonable price. The Samsung SNK9175ST microwave would be a godsend for making delicious meals quickly, which is something my family definitely needs most days since we’re always on-the-go and racing our busy schedules. Its combination of convection and microwave heat as well as the 200 built-in recipes would make mealtimes a lot more workable without sacrificing the quality of the end products. Plus, it’s a beautiful piece of equipment! Oh, how I desperately need washer and dryer. If I can only choose one appliance though, it would be a clothes dryer. I’ve been without one for well over 2 years and live in the Northeast, so I hang clothes outdoors to dry when the weather is nice, and if not, the clothes get hung all over the house. I mean on shower bars, chairs, wooden racks…wherever! My washer is a wreck and I have to manually turn on the hot and cold water faucets connected on the back and moderate the temperature. I watch it as it fills so it doesn’t overflow, then shut the water off, let it wash the clothes, turn the water on to rinse them, then off to spin. I spin many small batches of clothes at a time to wring the water out before drying them. It’s exhausting and time consuming. I would be grateful with anything! I would love the Samsung Dishwasher DMR77LHS. I love that it has quiet operation as my current one is loud. A Samsung refrigerator would make my life easier. A stove would make my life easier! I really could use the refrigerator. Mine gave up but we still have the freezer working.